Episode 24 English. An ankylosaurus is a type of dinosaur. Gomamon + OO The super heavy weight attacks he uses cause 2 or 3 times as much damage! Has the power of "underground"
If the opponent is a Bird Digimon, attack power increases by 30. 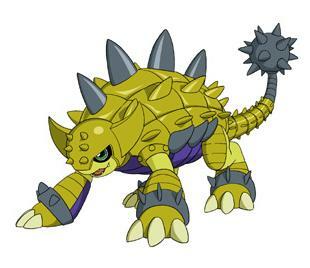 Psychemon + OO His heavy shell is like an iron wall! His body blow is megaton league! Has the power of "underground"
Attack increases by 50 against opponents with the power of "fighting"